There are dozens of firewalls out there to ensure computer’s security, but Comodo Firewall is more capable of protecting your data from both computer and network attacks with its prevention-based security mechanism, attractive GUI, huge configuration options, and personalized protection. It offers advanced features which the default Windows operating system doesn’t. This tool monitors all incoming/outgoing connections and blocks malicious threats before they infect your system. Comodo Firewall secures all connections while you are online, keeping away hackers and other intruders effectively. It converts your DNS servers to Comodo SecureDNS servers and allows “Cloud Based Behavior Analysis” of unknown programs as soon as it installs on your PC. The latest version 6.1 has user-friendly interface with a variety of options and controls to examine your PC status. The main interface shows the security, update, and the realtime protection status. Down the window, you can view the important tools such as Scan, Update, Virtual Disk, Shared Space, Task Manager, etc. You can drag-n-drop programs or applications which are needed to be filtered in ‘Sandbox Objects’ section. 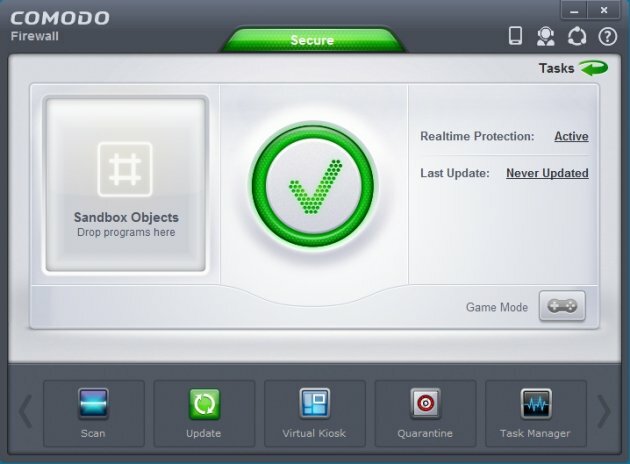 You could also enable ‘Game Mode’ by which the Comodo Firewall utilizes less system resources while playing games. The ‘Tasks’ button shows you the Comodo’s General, Firewall, Sandbox, and Advanced Tasks and also has the input-text field to search tasks right away. It installs a desktop widget that shows the system security status as well as the download/upload speed and current running applications. DDP (Default Deny Protection) ensures only recognized PC-safe applications are executed. Prevent viruses and malware before they infect or access your computer using ‘Prevention-based Security’. Auto Sandbox Technology virtually creates an isolated environment for unreliable programs such that no malicious software can reach your computer. Get timely alerts when any software is allowed to create/operate system files. Detects zero-day malware automatically with ‘Cloud-based Behavior Analysis’. Cloud Based Whitelisting identifies safe files/documents that are from trusted publishers and vendors. Application Control provides the ability to run only trusted applications and the rest can be locked for PC’s safety. The ‘Game Mode’ restrains alerts, database updates, and scheduled scans so that the user’s gaming experience could be smooth without any freezes or hangs. The interface is user-friendly and organized well to navigate through various Comodo Firewall’s protection features and options. Get Automatic Updates from Comodo’s cloud server. View actions performed such as add/move/remove/block files in a log file. Comodo Firewall is the best and strongest firewall software available in the market which certainly recommended by many experts for maximum and controlled PC protection. The tool supports Windows 7, Vista and XP (32/64 bit) and requires at least 128MB RAM and 210MB hard disk space to run. While installing the application, please be sure to uncheck options like changing the homepage, changing the default search engine for web browsers. You can download the latest version Comodo Firewall 6.1 which has many improved features such as the desktop widget, sound effects, offline virus database update functionality, file submission and lookup operations, and many more.